Russell left for the airport at 6:30 this morning with Mohammed, our favorite taxi driver. I have arranged for Mohammed to head to the airport 7 times in the last 3.5 weeks, so I have given him quite a bit of business. After Bridget headed home late Sunday night, Russell and I made a quick trip to Damascus. We experimented with transport– instead of shared taxi, we took a minibus there and a big bus back for $5 each way. The minibus was great, but the ride back on the bus was pretty unpleasant. It kept stopping so it took twice as long to get back to Beirut, there was little a/c and the windows didn’t open, the brakes were questionable and squealed and burned all the way down the mountain. There were some funny backpackers on the bus, including a Dutch guy who was incredulous that not only did I not have problems getting into Syria as an American, but that Americans pay less for visas. At any rate, we had a good time in Damascus- saw the mosque, the souqs, the old city. We tried to go to my favorite restaurant from last time, Zeitouna, but it is now undergoing a major renovation and looks like it will be closed for awhile. We ended up going to Elissar, which is a little bit more upscale, and somehow ended up ordering (beef) fondue (!) which was delicious, but seemed a strange thing to be eating in Syria. We had spent a fair bit of time over the course of 2 days trying to find the “puppies and snakes” that Ray and Geoff had seen when we were there a few weeks ago. As we were walking back to our hotel to collect my bag before going to the bus station, we finally found them. 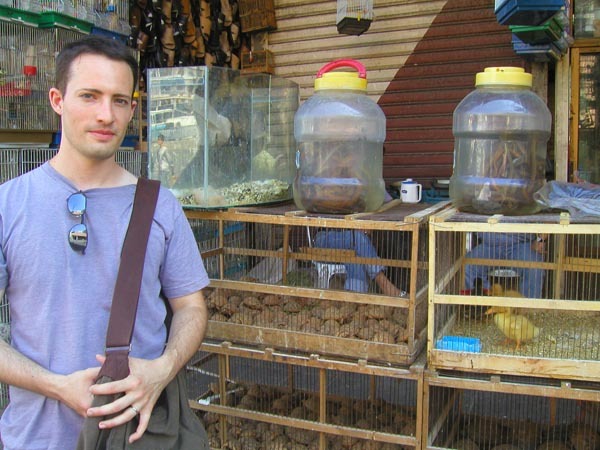 It’s sort of a live animal souq, with creatures intended as both pets and food mixed together. There were jars full of water snakes writhing around, all sorts of birds (from canaries and songbirds to geese and turkeys), puppies and rabbits. One seller for some reason sold nothing but cats and chickens. The bottom cages housed chickens (some rather fancy) and the top cages held many white cats of various ages. It was feeding time, and each cat, down to the littlest kitten, was chowing down on a chicken leg. Their neighbors below could not have been comfortable with this. My favorites, though, were the baby tortoises. There were several cages full of them, piled atop each other. I resisted the urge to bring a couple home. They were really cute. But baby tortoises grow up, you know. And I’m not sure if you can bring turtles from Syria to the US without permission. Maybe I will look into that. You are currently browsing the Amy’s Journal weblog archives for August, 2005.